There’s an increased risk of “unprecedented” winter downpours such as those that caused extensive flooding in 2014, the UK Met Office says. Their study suggests there’s now a one in three chance of monthly rainfall records being broken in England and Wales in winter. The estimate reflects natural variability plus changes in the UK climate as a result of global warming. But a supercomputer was needed to understand the scale of increased risk. Across the winter of 2013-14, a series of storms hit the UK leading to extensive flooding in many parts. 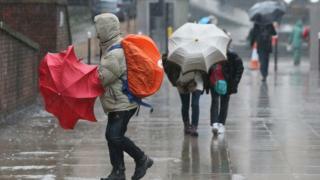 The amount of rain that fell in much of southern England and the Midlands was the heaviest in 100 years. Cleaning up from the resulting floods took time and money – the bill for the Thames valley alone was over £1bn. Met Office researchers say that there was nothing in the observational record to indicate that such an unprecedented amount of rainfall was possible. However, by using a climate model that takes the current climate period from 1981-2015 as its base, and running it hundreds of times on the Met Office supercomputer, researchers were able to find many modelled months with similar or greater rainfall to January 2014. Their analysis also showed a high risk of record-breaking rainfall in England and Wales in the coming decade. “We found many unprecedented events in the model data and this comes out as a 7% risk of a monthly record extreme in a given winter in the next few years, that’s just over Southeast England,” Dr Vikki Thompson, the study’s lead author told BBC News. Not only is there a greater risk, but the researchers were also able to estimate that these events could break existing records by up to 30%. “That is an enormous number, to have a monthly value that’s 30% larger, it’s a bit like what we had in 2014, and as much again,” said Prof Adam Scaife from the Met Office. Key to developing this new understanding of the risk of record rainfall has been adding the power of a supercomputer to create hundreds of realistic UK winter scenarios in addition to the observational record. Other experts believe that the new work will be very important to policy makers. “Although this year has been particularly dry, generally our winters are getting wetter and the rainfall heavier, so we are seeing more flooding and records broken,” said Prof Piers Forster from the University of Leeds who was not involved with the study. One of the key questions though is how much of a role does climate change play in increasing the risk of these large scale downpours? “There’s a good chance of a record and there’s a good chance that it would be much bigger than the current record,” said Prof Scaife. The new research approach has been dubbed the UNSEEN method, to emphasise that this work anticipates events that have not yet been seen. It was also used as part of the UK government’s National Flood Resilience Review (NFRR) when the Met Office were asked to estimate the potential and severity of record breaking rainfall over the next decade. That review led the government to adopt new stress tests to assess the risk of flooding from the rivers and seas. However there were concerns that the NFRR didn’t consider surface water flooding which can affect more homes and businesses. Some critics believe that in light of this new research, the review should be re-visited. “It should be an urgent priority for the Environment Secretary to re-open the National Flood Resilience Review with the aim of improving the UK’s preparedness against surface water flooding caused by heavy rainfall, the risks of which are clearly spelled out in this paper,” said Bob Ward, from the the Grantham Research Institute on Climate Change. The Met Office study is published in the journal Nature Communications.